Chicory (Cichorium intybus L.; Asteraceae) is a small aromatic and medicinal biennial and perennial herb that is distributed in most parts of Europe and Asia including Iran. However, little information is available about seed germination (SG) and seedling growth of this plant in response to abiotic environmental factors. 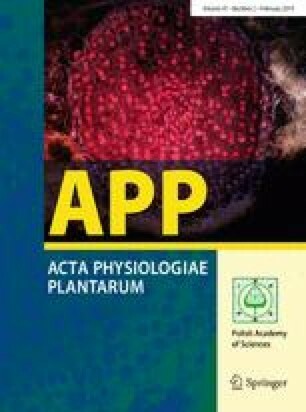 Therefore, this study aimed to investigate the effect of several environmental factors such as temperature (T), water stress (ψ), salinity, pH and burial depth on SG characteristics of chicory. Results indicated that all studied traits including germination percentage (GP), germination rate (GR), germination uniformity (GU), normal seedling percentage (NSP), root length (RL), shoot length (SL) and seedling dry weight (SDW) are significantly influenced by each environmental factor. Estimated cardinal Ts were 3.5, 28.9 and 40.2 °C for the base, optimum and ceiling T, respectively, with a thermal time 330.2 °C h after fitting a beta model in water. The drought tolerance threshold value was − 0.82 MPa for GP and − 0.75 MPa for NSP. The sensitive of each trait to ψ was ranking RL > SL > GR > SDW > NSP > GP. Increasing salinity level from 0 to 250 mM declined GP, GR, NSP, RL, SL and SDW by 75, 83, 88, 85, 80 and 60%, respectively, and also GU decreased seven times compared with the control. The salt tolerance threshold value was 223 and 194 mM for GP and NSP, respectively. Although chicory seeds were able to germinate at all pH levels (84%, ranged from 2 to 10), they could not produce an equivalent normal seedling in the same condition which indicates that seedling growth is more sensitive to pH relative to SG. The best pH for germination and seedling growth was estimated to be ~ 7 for this plant. Seedling emergence increased by 25% as burial depth increased from 0.5 to 2 cm and then sharply decreased by 87% when reached to 4 cm. The best burial depth ranged from 1 to 2 cm (> 88%) for chicory. Consequently, this information could help us to adequately manage the production of this plant under different environmental factors and also to determine its geographic range expansion in the world. This research is supported by the Genetics and Agricultural Biotechnology Institute of Tabarestan (GABIT) and Sari Agricultural Sciences and Natural Resources University (SANRU) research grant. The authors gratefully acknowledge use of the services and facilities of the GABIT during this research and also Dr. Raoudha Abdellaoui for scientific and linguistic revisions.